SINGAPORE --- Zycraft Pte. Ltd. announced today that it has successfully completed the Phase 1 development of the Vigilant Class Independent Unmanned Surface Vessel. A lead vessel named the LongRunner has already completed over 24 months of in-water testing in Singapore waters and traveled a total of 2000 nautical miles. During this period, the vessel also participated in several Fleet Battle Experiments and demonstrated continuous unmanned operations exceeding 48 hours and traveled 100 nautical miles into the South China Sea. The LongRunner was remotely commanded and controlled from Zycraft’s headquarters ashore using satellite communications. The 16.5 m length IUSV has an endurance exceeding 1200 nautical miles thus allowing it to operate base to base and independent of a mother ship. Once launched from its base, the IUSV transits to the area of operations and can remain on station for extended periods, requiring infrequent refueling at sea to extend its endurance. Smaller USVs depend on a mother ship and often face difficult launch and recovery operations that hamper safe operations. With the IUSV concept, navies also do not need to build bigger ships simply to carry small USVs but instead can rely on the size of the bigger IUSV to have high endurance and carry the needed payloads. The LongRunner is built using the world’s most advanced composite material called Arovex. The carbon nanotube infused carbon fibre material provides exceptional hull strength resulting in a lighter hull that uses less engine power to achieve the desired speed. Conversely, it allows more payload and fuel to be carried for enhanced range and operational capabilities. Zycraft is currently working with several vendor partners to introduce their cutting edge sensor technologies onto the IUSV. This will further enhance the ability of the IUSV in all its intended roles. Zycraft (Zycraft Pte. 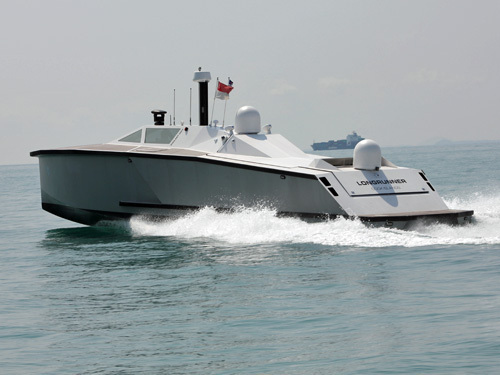 Ltd.) is a company registered in Singapore, and specialises in the design and manufacturer of Unmanned Surface Vessels and special high speed manned boats using advanced nano composite materials. The company also develops unique security solutions for the maritime industry to counter the threat of piracy and sea theft.